QUIK-CURE™ 5 min. epoxy cures to a slightly flexible consistency. This lack of brittleness allows it to form a lasting bond in areas subjected to high vibration or stress. QUIK-CURE™ shouldn't be used in areas that are subject to long-term immersion in water, however, it works fine for the internal structure of wood framed boats. 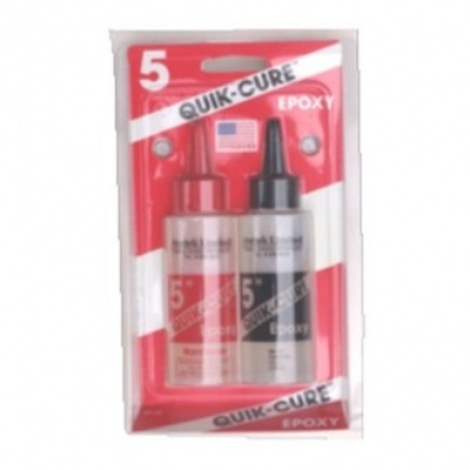 QUIKCURE™ is our only epoxy on which you can apply polyester resins. It can be mixed with microballoons to form a quick setting putty. Items bonded with QUIK-CURE™ can be handled after 15 minutes. Full strength is reached in 1 hour. See also: Reference chart when selecting CA (Super) and Epoxy glues.